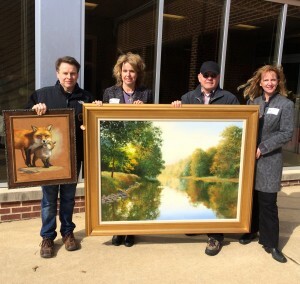 Artist Shawn Faust (left) displays “Mother’s Day,” the painting he donated to the 65th Annual Chadds Ford Art Sale and Show, as co-chairs Frances Galvin and Lynda Nadin (right) hold “Along the Brandywine” with featured artist J. Wayne Bystrom. You might think that an annual art fund-raiser with a regional reputation so stellar that it has to turn away artists might run itself after decades of success, but it’s precisely that prestige that adds pressure, say organizers. This year, the stress to outdo the popular Chadds Ford Art Sale and Show – to be held Friday, March 21, and Saturday, March 22, at Chadds Ford Elementary School – received added fuel from its history: Betsy Wyeth founded the event in 1949. Undaunted by the challenge of celebrating the 65th birthday, co-chairs Lynda Nadin and Frances Galvin said they found a way to honor the show’s impressive pedigree by involving another talented member of the Wyeth clan in this year’s festivities: Victoria. “I’ve heard nothing but rave reviews on her speaking engagements,” Nadin said. Indeed, Victoria Browning Wyeth, Betsy and Andrew’s granddaughter, first garnered acclaim nearly a decade ago for a tour-guide stint at the Brandywine River Museum, where she dazzled crowds with her effervescence and insight into works by her famous relatives. Besides her grandfather, they include her great-grandfather N.C. Wyeth and her uncle, Jamie Wyeth. She soon found herself in demand as a speaker. Victoria Wyeth is scheduled to do a high-octane presentation on her family’s art at 11 a.m. on Saturday. Following her Power Point, which will include paintings in private collections and insider anecdotes, she will sign copies of Andrew Wyeth: Autobiography by Thomas Hoving. But organizers point out that Victoria Wyeth represents just one of myriad reasons to attend the two-day show, which will feature works by about 70 professional artists from the Brandywine Valley and as far away as North Carolina. This year’s featured artist is Kennett Square’s J. Wayne Bystrom, a nationally recognized talent who is delighted to be serving that role for the second time, a status that gives him extra display space. The event’s donating artist for 2014 is Shawn Faust from Bear, De. A bittersweet component of this year’s show will be a tribute to the late Paul Scarborough, a beloved artist who was a regular contributor to the show. Organizers said his art will be sold, and a scholarship is being created in his name. “He’s been a big part of the show for a long time,” said Diane Micklin, one of the organizers as well as an exhibiting artist at the show and sale. The show will begin Friday night with an adults-only complimentary reception and sale from 7 to 9 p.m. Visitors will be treated to live music, hors d’oeuvres, and an opportunity to meet and talk with the artists, many of whom will be available to sign or personalize their work. The great food is also a huge draw for artists and the public that night, Galvin said. Besides the Victoria Wyeth program, Saturday’s 10 a.m. to 4 p.m. lineup will feature live music and a raffle drawing at 3 p.m. Visitors will see a broader spectrum of work this year with artists in jewelry, glass, and furniture, interspersed with some food sampling, Nadin said. An Art Café will be set up from 10 a.m. to 3 p.m. so that children ages 5 to 12 can create their own masterpieces. Another highlight: Andrea Pandolfi, Chadds Ford Elementary’s expert on the school’s renowned art collection, will conduct tours at 1 and 2 p.m. “She has done a lot of investigating on the whole historical impact and how we got the paintings and who is connected to who,” said Nadin. In addition to enjoying the show’s audience, Bystrom, who has three paintings in the Philadelphia Art Museum’s permanent collection, said he appreciates the end result. “The main reason I do this show is for the kids,” he said. Faust, a newcomer to the show, said that because the event has earned a great reputation among artists in the community, his sister-in-law, who teaches at Chadds Ford Elementary, didn’t have to do much arm-twisting to get him to participate. Faust, a University of Delaware graduate who has worked in portraits – such as a 1992 commission to paint the official likeness of outgoing Delaware Gov. Mike Castle – has also developed a following as a premier equine artist. He said he’s looking forward to the opportunity to connect with a new audience. “There’s nothing more exciting than when you have a painting that moves someone…,” he said. And based on the enthusiastic reactions of the show’s organizers to “Mother’s Day,” the 16×20 oil painting of a fox and her cub that he donated, he’s likely to experience more excitement this weekend. All proceeds from the show support educational enrichment programs at Chadds Ford Elementary School. “We want to top last year,” said Nadin, a goal that will require more than $22,000. Organizers said 30 percent of all purchases are tax-deductible, and Visa and MasterCard will be accepted. For more information, visit www.cfes.ucfsd.org/artshow.